Every now and again I put in more than my regular amount of effort into my meal prep and I end up doing some intense freezer meal cooking and that is exactly what happened this weekend. This weekend my husband and I did our big grocery shop on Friday to save us some time on the weekend and to also make sure I could get a head start getting the meals ready and prepared without having to run around on top of all the cooking. So what was on then menu? The plan was to make some tasty chicken wings for supper on Saturday and then make some freezer meals which would be: lasagna, quiche, meat balls, quinoa salad and dragon noodles. 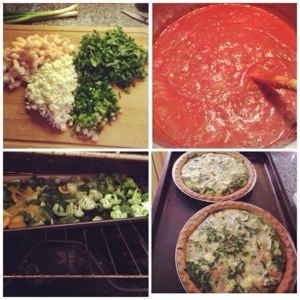 In the end I ended up making clean eating chicken wings, lasagna and quiche. I pawned the making of the dragon noodles off on my husband and figured I could make the rest later this week. In between slicing, dicing, cooking and assembling the meals my mom and I went and did some shopping and ran some errands which was definitely a nice little break from being in a hot kitchen. Once it was all done and labeled I was ready to plop myself down on the couch and watch a movie before serving up a healthy serving of lasagna for supper. I hope you all had a great weekend and had a chance to kick back and relax. 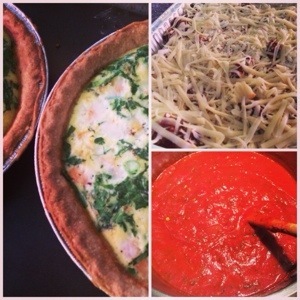 This entry was posted in Food, General and tagged clean eating, freezer meals, healthy-living, lasagna, meal prep, quiche, weekend by healingginger. Bookmark the permalink.